Wader Quest: The incredible E7 Bar-tailed Godwit - Record breaking migration flight. 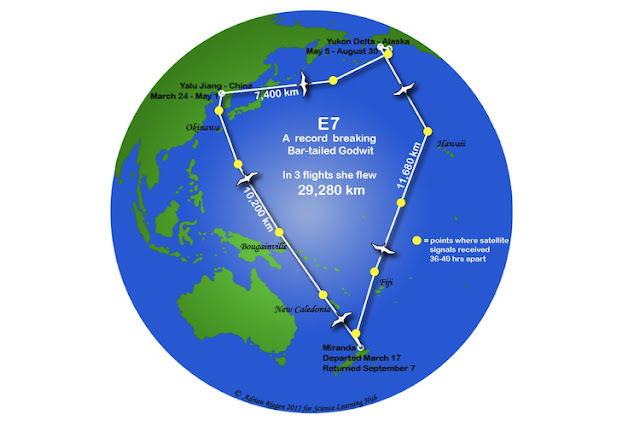 The incredible E7 Bar-tailed Godwit - Record breaking migration flight. For some time it had been mooted that the baueri race of Bar-tailed Godwit travelled from Alaska to New Zealand non stop. Marked birds had been seen in Alaska and then reported in New Zealand some days later in a time scale that would not allow for the birds to have made a stop over. Attempts to track birds travelling from Alaska to New Zealand failed, so the conjecture continued. A satellite tagging scheme to track the birds' return route was more successful and a female Bar-tailed Godwit known affectionately as E7 was fitted with one such tag. Unbeknown to all concerned this elegant bird was to be catapulted to fame. The transmitter was fitted in order to confirm where the Bar-tailed Godwits of New Zealand stopped over on their journey back to Alaska. In this case our lady stopped at the Yalu Jiang Nature Reserve on the Yellow Sea which is more or less what was expected of her; a single journey of some 10,200 km in itself. She then went on and returned to Alaska a further 7,400 km to the north-east again non stop. This though is when things started to drift into the realms of fantasy for the scientists. The battery in the transmitter that was fitted to E7 had a supposed life of some six months, just enough to get it to the breeding grounds, but unbelievably this battery just kept going and going. Eventually E7 left her breeding area and her transmitter was still sending signals. The scientists, some utterly amazed, others less so as they had suspected as much already, watched as the bird flew a staggering 11,700kms in one flight of over eight days, non-stop back to New Zealand. 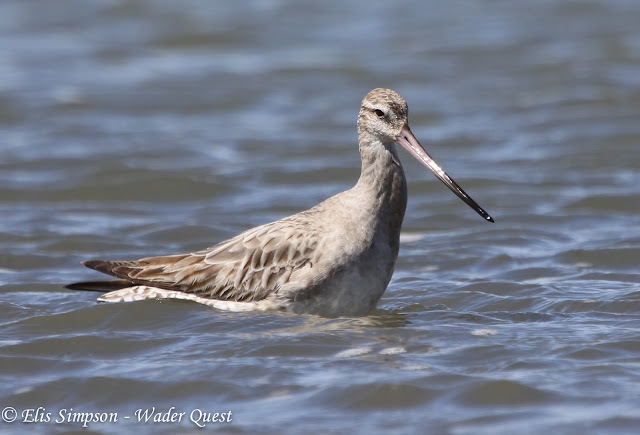 This godwit had recently arrived from its epic migration for Alaska. On arrival some birds display this drooping wing posture, and who can blame them? This shot E7 into the record books as the longest distance recorded in a single flight by a bird and the incredible thing was the discovery was made more or less by chance due to a battery outlasting its normal lifespan. We didn't see E7 when we visited New Zealand, more’s the pity, but the last we heard she was still alive albeit with only one leg now and a crooked neck. She’s no longer travelling back and forth between Alaska and New Zealand though, she has retired to the Maketu Estuary and is often seen on the Pukehina Spit. David Thomas tell us that the last sighting of E7 was by Tim Barnard on the 14th of September 2014 seven years after her banding date. The sad caveat to this tale is that it seems that most if not all of the baueri godwits from Alaska migrate north via the Yellow Sea. If this is the case and the destruction continues at the pace at which it currently is, it is very possible that the entire Alaskan godwit population could be wiped out. A sobering thought. She was seen Sept 14th 2014 by Tim Barnard, but not been reported since. Thank you for the update Tim, good to know. Looks like she may have finally succumbed to the inevitable as she is so distinctive. But, you never know. Do let us know if she is seen again. Thanks. Rick and Elis.